Is Your Gut Making You Moody, Sick & Tired? Our digestive health is directly connected to our mood and sleep health. This was already established over a hundred years ago by Nobel-recipient Dr. Elie Metchnikoff, a pioneer in the field of intestinal microbes, probiotics in yogurt, and the relationship of toxins, including ammonia, phenols, and indols, in relationship to aging and mental health. Stress, lack of rest, and infections suppress the parasympathetic nervous system that governs our digestion. If we live mainly in Fight-or Flight mode without appropriate relaxation and mental rest, this is when problems start to arise in our body and the resilience to fight infections goes down. And our digestion goes south, too, as the body is not concerned with digestion when it is busy fighting battles for us in our daily life. No wonder acid blocking meds are top – selling prescription drugs. Food sensitivities, gluten sensitivity and autoimmune diseases involving IBS, ulcerative colitis and crohn’s are on the increase. There is great awareness in Functional Medicine and Holistic practice that any trouble in our gut has great potential for systemic implications, and mental unwellness. Immuno-suppressing drugs are among top-five sellers today, as are oncology drugs. Yes, immuno-suppressing can be lifesaving, however, what are implications in the long-term? If the immune system is suppressed, it increases the risk for cancer….viral infections and chronic respiratory infections too. With autoimmune conditions, the medical history, internal and external infections, surgical and dental interventions, trigger foods, heavy metal toxicity, emotional stress, PTSD, genetic predisposition, mold exposure in water damaged buildings, pesticides, aluminum toxicity in the air, and antibiotics in foods, all must be considered. What riles up the immune system in a process that is accompanied by chronic inflammation? 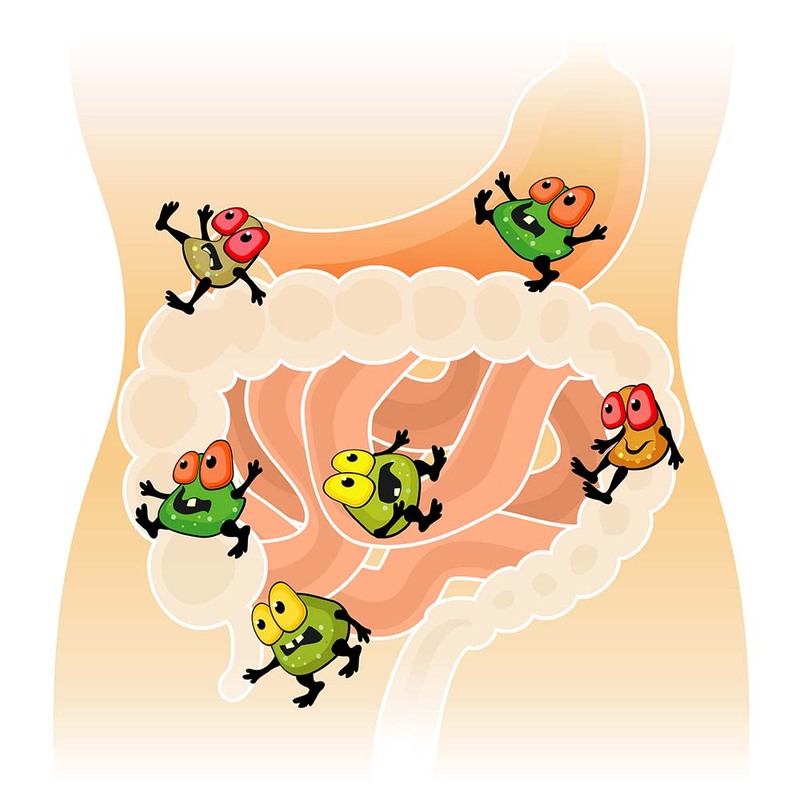 Should infections such as Lyme disease or a spider bite be followed up with antibiotic treatment, that can set the scene for a compromised gut lining and gut flora. An infection and /or medical intervention can create a cascade of events that if not managed appropriately, and timely, can have severe and lifelong consequences. An infections, e.g. Lyme, if not diagnosed and treated early, can travel to the brain resulting in symptoms that can be mistaken for schizophrenia, MS or Autism, or it can affect vagus nerve in the gut resulting in ongoing digestive troubles and secondary gut infections such as SIBO (small intestinal bacterial overgrowth). Lyme and other infections can also set up sanctuaries in the joints, or in the lymph glands in the breast where this can later contribute to breast cancer. It can become a cascade of events. Another process, where foreign molecules mimic our own tissues in a process called molecular mimicry, also invokes an excessive immune response as the immune system attacks our own tissue. This can also occur in the thyroid (Hashimoto’s is prevalent), the pancreas (diabetes Type 1), the brain, and joints too. Symptom Suppression versus Root Causes? Traditional gastro-enterology does not embrace the philosophy of root cause (s) investigation; the focus is on determining pathology, giving it a label, and then symptom –suppression with pharmaceuticals. This can be absolutely life-saving when in crisis, no doubt about that as it is necessary” to throw the whole kitchen sink” at a situation when it is out of control and life is threatened. However, when a situation is stabilized with meds, then it would be prudent to start to investigate why the body’s systems have gone errant. Our body is smart. It is also trying to ensure survival and it adapts and compensates when it is threatened, poisoned or compromised by infection (either external including Lyme disease) or internal latent infections, e.g. EBV, strep, Clostridia or C-diff. Thank you for reading the above. Gut health (and Lyme disease) is a big part of my work as a holistic health practitioner. A good starting point is to consider your nutrition, exercise, sleep, hydration and time away from technological devices – these foundational principles matter greatly for all of us. Take care of your gut by eating healthy fats, naturally raised foods and organic produce that contain fewer pesticides, antibiotics and refined sugars. Check your vitamin D levels, get into Nature and find ways to lower your stress. Go out and have fun, share laughter with friends and participate in activities that bring joy into your life. What Is Medicine of the 21st Century? Got Lyme Disease, Or Know Anyone Who Does? Get this book! Rika is trained extensively in Applied Clinical Nutrition, Metabolic Typing, Functional Diagnostic Nutrition and Exercise. As a Health Expert, she is able to address underlying metabolic imbalances contributing to e.g. digestive ailments, weight gain, food sensitivities, skin conditions, fatigue, Candida, immune dysfunctions, inflammation, hormonal imbalances, painful joints and detoxification concerns. In addition, she can provide a metabolic - health evaluation of blood labs. As an Exercise Expert, she is able to facilitate improved function, sports performance and post-surgery rehabilitation exercise. As a Health Advocate, she is an impassioned and knowledgeable speaker on a broad range of holistic Wellness topics.